There is something so compelling about this squeaky cheese, and my fridge is stocked with it at all times. Most regularly I treat it as vegetarian bacon, dry-fried in a hot pan then dolloped with a peeled, soft-boiled egg. But the idea for this recipe came to me one evening when I felt the need to counter the siren call of the halloumi’s saltiness with some sweet-and-heat. Slice 2 of the chillies, leaving the seeds in, then de-seed the third and chop it into fine dice (this is for full-on fieriness; you may de-seed more cautiously if you wish) and add to a small pan – ideally, the sort sold as a butter-melting pan – along with the honey, and squeeze in 1 teaspoon of lime juice from one half of the lime. Put the pan on the smallest ring on the hob and bring to a bubble, then turn the heat down low, and let it foam away for 4 minutes. Stir frequently and do not leave the pan unattended, otherwise it will foam over the hob. Remove from the heat. Before you turn to the halloumi, arrange a few salad leaves on 2 plates, and pour as much or as little oil over them as you want. Cut the remaining lime half into wedges, and pop one on each plate if so wished. Heat a cast-iron or heavy-based frying pan. When it’s hot, add the halloumi slices and cook them – without any oil in the pan – for 30–60 seconds until they are tiger-striped underneath, then turn the slices over and cook until the underside is patchily bronzed, too. 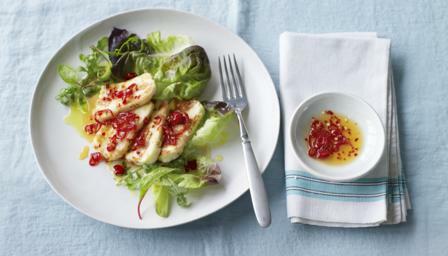 Remove the halloumi to the salad-lined plates and spoon the lipstick-red pieces of chilli in their honeyed glaze over the cheese. Eat immediately. Not hard to do.